I'm back! I don't know how long it's been since I last wrote a blog post, but I know it's been a really long time. Life has been busy, university has taken over amongst other things. If you want to see what I've been up to over the last year, you can go and check out my Instagram or Twitter as I've still been using those platforms. 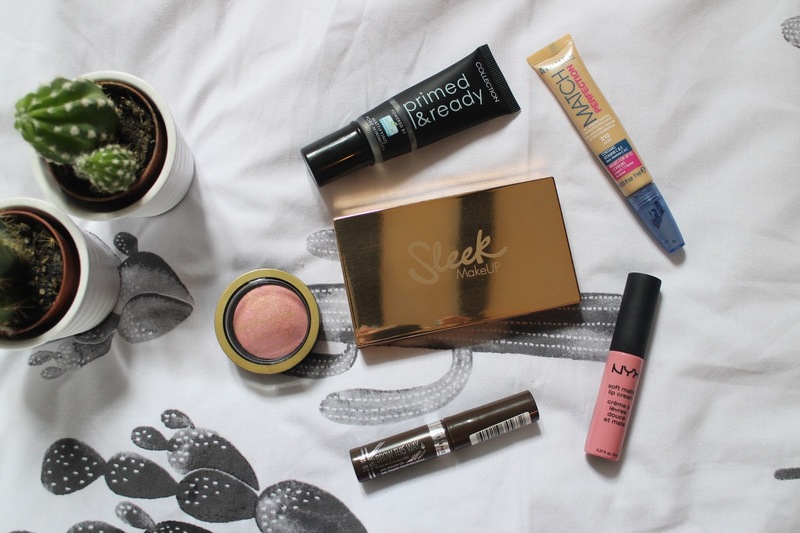 But I do still want to try to blog, and so today I thought I'd talk about the make-up products I love using now the weather has been a lot warmer. First up is the Collection Primed & Ready Primer. I always use a primer before applying foundation as my skin can be quite oily and if I don't then my make-up is prone to slowly melting off during the day, especially in the sun. This one is also 'powered by Witch' to keep the skin clear. As it is a silicone primer which doesn't feel all that natural, it's nice to know it's still good for my skin. Next is the Rimmel Match Perfection Concealer. This is new to my collection, and I have it in the lightest shade. I use this just under my eyes to give a nice brightening look. Then I have the NYX Soft Matte Lip Cream in the shade Istanbul. I only bought this the other week but I already love it! It's a pretty pink colour and goes on really creamy but then dries down to a matte finish. I've tended to lean more towards matte lips recently so I've loved using this. A product that I've loved for a while now is the Rimmel Brow This Way in Medium Brown. I've stopped filling in my brows with pencil as I just found it started to look too over the top, and so now I just use this to give my brows a natural but still full look. I honestly wouldn't go back to how I did them before, this takes all of two minutes and I love the outcome. Next is a new blusher for me, the Max Factor Creme Puff Blush in Lovely Pink. I've used my Nars blush religiously for about a year now but I've started switching it out occasionally for this one and I really like it. It gives a subtle pink glow to the cheeks, perfect for summer. And lastly is another cheeks product which is probably one of my favourite products in the whole of my collection - the Sleek Highlighting Palette in Solstice. I tend to use the cream and pink shades and mix them together and they make for such a gorgeous highlighter look. They have a few different variations of this palette and I'd definitely recommend them. I hope you enjoyed my first post back in a while. If it goes down well, I have some plans for other posts I could do, such as university related ones. Let me know what you think! As I usually do, I wanted to put together a photo diary from my recent trip abroad, this time to Crete. The only time I'd been here before was when I was little so it was interesting to come back again. The weather was always hot and the food was amazing. However, my favourite part was definitely getting to go parasailing on the beach! This has always on my bucket list and it was an incredible experience, I'd definitely recommend giving it a go. Another highlight of the holiday was being upgraded to our own villa for free, with our own pool! This had never happened before so it was a real treat for the last few days of our stay. My blog posts have been a bit random recently, but today I wanted to talk about beauty, specifically some new make-up bits that I've found in the drugstore recently. Bourjois Air Mat Foundation: Matte foundations are definitely the face products I reach for the most as my skin can get quite shiny throughout the day. As I love Bourjois, when I saw this new release I just had to give it a go. I chose the lightest shade which is pretty much spot on for me, and I really like the formula too. It takes a bit of blending in, but once applied it stays in place for ages. If you're a fan of the matte finish like me, I'd definitely recommend this product! Seventeen Stay Time Concealer: I've actually repurchased this concealer recently as I absolutely love it. I don't usually buy from Seventeen but I'm definitely tempted to try more from them after liking this concealer so much. It's the perfect concealer for under the eyes and on blemishes and gives a good amount of coverage. NYX Butter Gloss: I was super excited to see that Boots now stock NYX, and this was the first product that I've ever bought from them. I've used it a couple of times and so far I really like it - the formulation is very creamy and glossy. The shade I got is a pastel pink which I think is perfect for summer. NYX Micro Brow Pencil: After using Soap & Glory brow products for ages, I wanted to try something a bit different and so decided to pick up one from NYX. I chose the shade Ash Brown, which is slightly darker than the brown pencil from Soap & Glory but very similar in consistency and how it applies. At £7 it's also cheaper so I might end up switching to this one now! Rimmel Wake Me Up Mascara: I needed to pick up a new mascara and wanted an affordable one, so I decided to buy this one from Rimmel. I've never used a Rimmel mascara before, and so far I quite like it but probably not as much as my usual ones. The brush is a different shape, but also I find it doesn't do a lot for my lashes in terms of lengthening them. I'm going to let it dry out a bit first and see if I like it more then, but for now I probably wouldn't repurchase it. 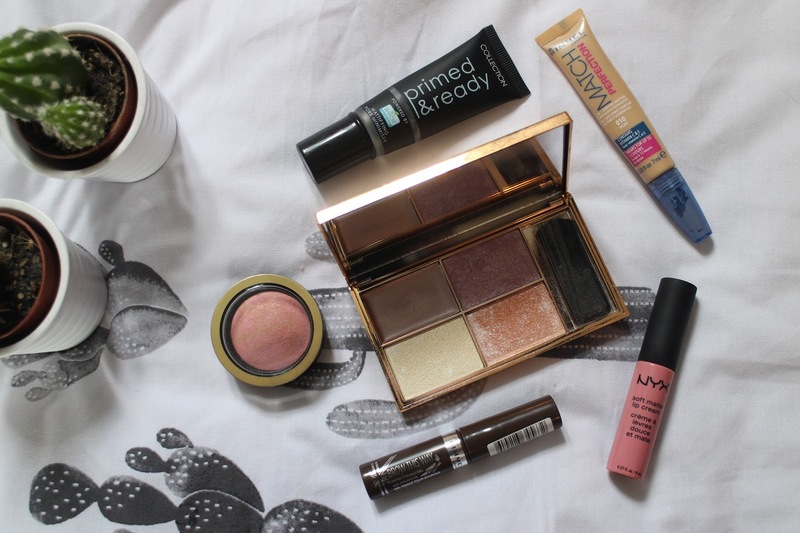 What have you picked up from the drugstore recently? Hey, I'm Sophie, a third year university student studying Public Relations. This is my little space on the internet where I chat about beauty, fashion and lifestyle - hope you enjoy! For PR or other enquiries: sophielizmay@gmail.com / sophieemay@hotmail.com.